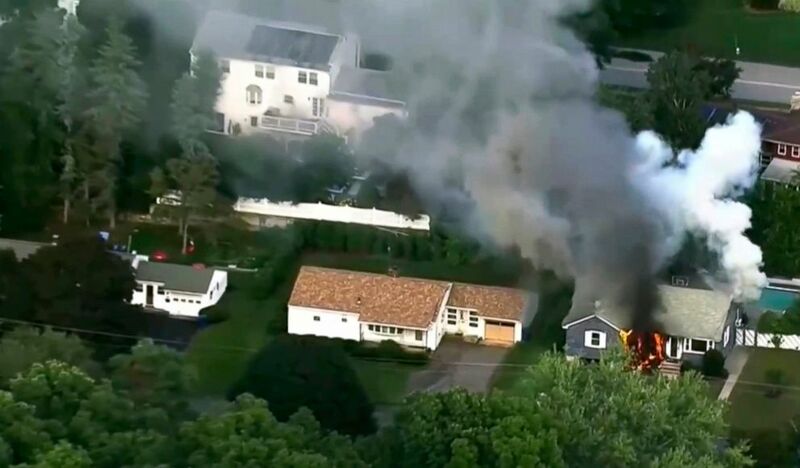 A day after a series of deadly gas-related fires and explosions tore through Massachusetts neighborhoods, the governor declared a state of emergency -- just as authorities said they had detected a major gas leak under a street that could have led to a "catastrophic" event. The leak was discovered by a police helicopter's camera that picked up an "anomaly" under a pavement in Lawrence, state police wrote on Facebook on Friday afternoon. "Through their attention to detail, the crew of MSP Air 5 likely prevented another catastrophic event," it wrote. Gov. Charlie Baker on Friday declared a state of emergency for the Merrimack Valley, where at least three explosions and as many as 80 fires had been reported as of late Thursday night, including the cities of Lawrence, Andover and North Andover, whose residents were forced to evacuate. Some residents who were returning to pick up essentials on Friday morning spoke about the frightening moments of the explosions and the devastation it left behind. Johnny Tran, who lives near the house where a teenager was killed by the blasts in Lawrence, was at home when the explosions occurred. "Suddenly -- boom!" he said. "I thought it was a car accident." "It was scary," he added. Tran said when he opened his door to see what had happened, all he could see was smoke. Then he saw someone being carried out of the nearby exploded house. The teenager, 18-year-old Leonel Rondon, was killed after one of the explosions sent a chimney crashing onto his car, Massachusetts State Police said. Rondon had received his driver's license the very same day, his friend Anthony Gil told ABC News. Gil said he came back to find his own house wrecked. Local officials described scenes of panic on Thursday as people, terrified that their home would burst into flames, fled. Aerial footage showed houses in smoldering ruins. The Massachusetts Emergency Management Agency (MEMA) blamed the fires on gas lines that had become over-pressurized but said investigators were still examining what happened, ABC affiliate WCVB in Boston reported. Columbia Gas CEO Steve Bryant said the company was "sorry" and "deeply concerned about the inconvenience," adding that he has no reason to take action against any employee at this point. Some residents who were inconvenienced, like Tran, slept in their cars. Others were at shelters set up by the Red Cross and other organizations. The Massachusetts Society for the Prevention of Cruelty to Animals--Nevins Farm offered refuge for animals. Those who needed to pick up important items like medicine from home were being transported by Merrimack Valley Regional Transit Authority. On Friday, hundreds of technicians fanned out across Massachusetts communities, going from house to house to check whether each was safe to return to. The National Transportation Safety Board also sent a team to investigate. "Please do not enter your house unless you are accompanied by a gas company representative," Columbia Gas warned in a statement it issued on Friday, adding that its crews would be visiting the home of each of the 8,600 affected customers to shut off each gas meter and conduct a safety inspection. Authorities urged those returning to pick up items not to turn on their gas if it has been shut off. “Our city has had a rough day today,” the city of Lawrence said in a statement early Friday morning. “We grieve for the loss ... and continue to support first responders." ABC News' Lindsey Davis and the Associated Press contributed to this report.